Looking for a cuddle partner in Atlanta? Duncan’s getting lots of hugs at the shelter but what he really needs is a permanent family to love him forever. Duncan was found abandonded in the wake of Hurricane Irma. Covered in wounds and scars, rescuers think he may have been part of a dog-fighting operation. But that life is behind him now as he’s soaking up all the love and attention these Georgia volunteers can give him. Sarah Rosenberg, a manager at LifeLine Animal Project, fell in love with the pup as soon as his kennel door opened. 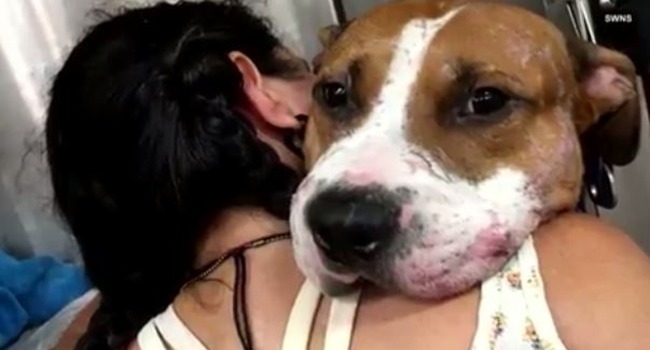 A rescue dog is soaking up hugs and kisses after he was found abandoned on a Georgia porch after Hurricane Irma roared through the region. He’s been at a shelter in Atlanta since September 14 and since then, he’s been overdosing on love, comfort and kindness. Rosenberg said Duncan is now slowly being nursed back to help and staff are getting him ready to find his forever family. He enjoys being out in the sun and loves children. To adopt Duncan, visit the shelter’s website.